Fundraisers should not accept donations from people who appear unable to make an informed decision, and should return donations if they find evidence that a person lacked capacity when making them, according to new guidance from the Institute of Fundraising. The guidance,Treating Donors Fairly, advises on implementing a new rule in the IoF Code of Fundraising Practice. 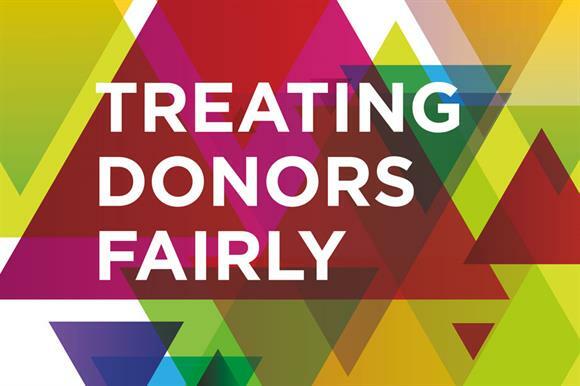 The rule says fundraisers should treat all donors fairly, enable them to make informed decisions, and make sure the needs of people in vulnerable circumstances are taken into account. The rule follows a Fundraising Standards Board adjudication in April on a complaint against the PDSA about the veterinary charity's acceptance of accepted several large donations from a woman with schizophrenia. The FRSB did not uphold the complaint but asked the IoF to consider including advice on vulnerable donors in the code. The guidance was launched today at the IoF’s Individual Giving Conference in London. It says some people in vulnerable circumstances might still have the capacity to donate, but might need additional support to help them make their decisions. This might include delaying acceptance of the gift, a cooling-off period to allow donors to change their minds, or suggesting that the donor gets advice from family or friends. The guidance says that vulnerable circumstances could include physical or mental health conditions, having English as a second language or being under the influence of alcohol or drugs. It says that fundraisers should watch out for signs that the prospective donor appears confused, such as asking irrelevant questions, displaying signs of forgetfulness and saying "yes" or "no" at times when it is clear that they have not understood. It says that telephone fundraisers should politely end calls with individuals who they believe to be unable to make an informed decision, and if the person is found to lack capacity, the charity should put in place measures to ensure that donations would not be solicited from them in the future. After the FRSB rejected the complaint about the PDSA in April it asked the IoF to review its codes of practice to provide fundraisers with better guidance on identifying vulnerable adults and encourage a consistent approach toward this demographic across all fundraising methods. "It should not be underestimated how real the challenge is for fundraisers to identify people who find themselves in vulnerable circumstances and to act appropriately," said Alistair McLean, chief executive of the Fundraising Standards Board. "The changes to the code and accompanying guidance are a welcome step forward that will give fundraisers greater clarity about what actions are acceptable and recommended in these situations, reinforcing public trust and confidence." Rob Wilson, the Minister for Civil Society, said in a statement: "I welcome this important and responsible update to the Code of Fundraising Practice, which will help fundraisers identify people in vulnerable circumstances and adapt their approaches accordingly. Strong standards of best practice are vital to the system of self-regulation of fundraising and in maintaining public trust and confidence."